Patna, Feb 7 (IANS) Leader of Opposition in Bihar Assembly Tejashwi Yadav on Thursday taunted Chief Minister Nitish Kumar saying he could become the Prime Minister for not speaking against Central government's 13-point roster to end reservation for SC/ST and OBCs. "Nitish Kumar has been involved in BJP's deep conspiracy to end the reservation. If you don't speak against the roster and wear saffron 'jama' of RSS, you will be rewarded for it... and be made Prime Minister," he said. The former Bihar Deputy Chief Minister made these remarks ahead of his Berojgari Hatao and Arakshan Badhao Yatra, beginning from the state's Darbhanga district on Thursday. 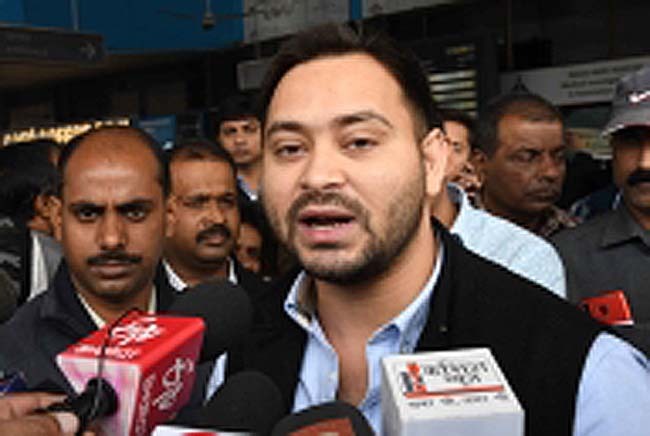 Tejashwi, the younger son of Rashtriya Janata Dal (RJD) chief Lalu Prasad, also extended his support to former Uttar Pradesh Chief Minister Mulayam Singh Yadav for staging a protest against the 13-point roster in the Parliament premises in Delhi. Last week, Tejashwi protested in Delhi against the 13-point roster. During his protest, he had stated reservation is not a scheme to improve incomes, but is a policy to provide representation to backward castes and demanded increase in reservation of OBCs according to their population. His father Lalu Yadav described it (the roster) as a "casteist policy" to eliminate the Scheduled Castes, Scheduled Tribes and Other Backward Classes from higher education. The RJD is set to make the 13-point roster one of its issues for the Lok Sabha polls to consolidate the OBCs and Dalits.